A scrap metal dealer hailing from the US Midwest had the shock of his life when an apparently innocuous looking gold coloured ornament that he purchased at a market where junk items are being sold turned out to be an extremely valuable item. The dealer had no idea whatsoever at the time of buying the item that he was in the process of creating history. In a surprising turn of events the scrap merchant became the owner of a Faberge egg hailing from the court of imperial Russia. There have been several reports regarding the tumultuous history of Russia's elite at the time when the 8 cm (3inch) golden egg was reportedly spirited out of St Petersburg. It happened as a result following the tumultuous events of the Bolshevik Revolution that took place in 1917. 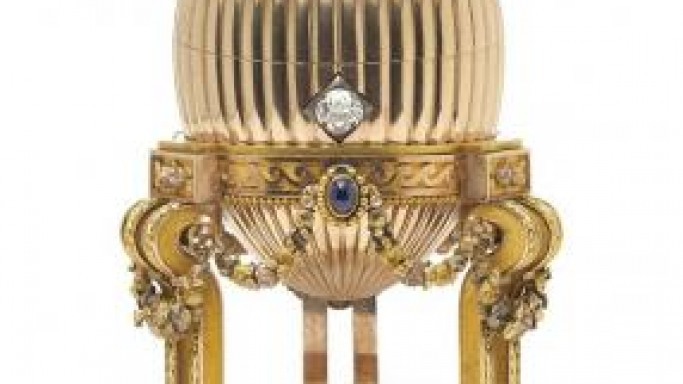 The coveted Faberge egg somehow disappeared for several decades in the United States after its arrival from Russia. However several years later an unidentified person while searching for gold scrap spotted the unique egg and purchased it for $14,000, hoping that he would make easy money by selling it to the melting pot where precious metals are smelted. Interestingly his plans did not materialize when he discovered that he had overestimated the value of the watch and gems which were present inside the egg. Reportedly after finding no takers for the distinguished egg the trader searched the internet in much desperation hoping to find a solution to his problem. It was then that the stunning realization hit him that he might have the same egg that was gifted by Russian Tsar Alexander III to his wife, Maria Feodorovna in the year 1887 as an Easter gift. The dealer approached the famed London Wartski antiques dealer to confirm his suspicion that he was in the possession of something extremely precious. The director of the Wartski antique dealership, Kieran McCarthy claimed in his media statement that when he researched about the Imperial egg and discovered it to be completely genuine he just could not believe the treasure he had stumbled upon. The precious egg was then acquired by an unidentified private collector for an undisclosed sum. However McCarthy did not reveal the identity of the buyer to the media. According to sources it has been estimated that the egg is valued at a whopping $20 million.